Eva Abbott sells her inheritance in England, Bellerose Manor, to provide for the care of her nephew. She buys a pineapple plantation in Hawaii but discovers her neighbour, Luc Martineau, will do anything to take it from her. When Eva discovers a diary which may solve their financial problems, villains follow her to Hawaii and attempt to force her to reveal the whereabouts of the heirloom emerald necklace. Is Luc an ally or an enemy? Is he after Eva or her land? Liked this book it’s about love and jealousy and insecurity on both sides of a relationship and both sides not wanting to give in. Winning the Heiress’ Heart is a beautifully written third installment in The Emerald Quest quartet. It can be read as a stand-alone book but I highly recommend reading the first two books as they add so much background information and are wonderful books in their own right. 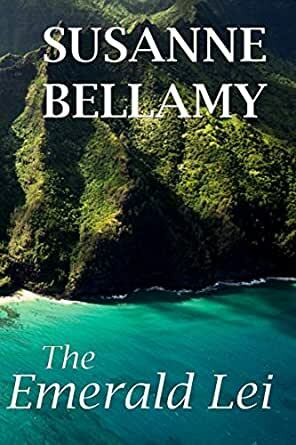 The warm tropics of Hawaii is the setting for this book, bringing the readers back to where Madeleine Bellerose and Sebastien Leclerc lived after their story in book one. The scenes seem to jump off the page as Susanne’s wonderful details can be vividly pictured. Evangeline “Eva” Abbott has very reluctantly had to sell the beloved Bellerose estate in England due to crippling death taxes. Now the guardian for her nephew, Sebastian, she buys a pineapple plantation in Hawaii knowing of the family link there. She has read Josephine Dubois’ diary and from the stories handed down through the family for generations, knows that the elusive heirloom Emerald Necklace may be somewhere there if she can locate Madeleine and Sebastien’s plantation. Lucien “Luc” Martineau has been desperate to buy the Benson pineapple plantation that adjoins his, but after an ill-advised proposal to Benson’s daughter, Genevieve, the plantation was sold to Eva instead. When Eva literally falls into Luc’s arms, there is an instant and undeniable mutual attraction. Initially, Luc tries to negotiate with Eva to sell the property to him, but she is determined to successfully run the pineapple plantation herself and when a Russian plantation manager turns up on her doorstep, she believes all will be well. Seb is a great secondary character in this story with his teenage antics and Eva shows her true strength as a heroine in making Seb her main priority even though it has the potential to derail her growing romance with Luc. Suspense, drama, mystery, break-ins, sabotage and bad men make this an action packed story with lots of twists and turns that draws you in so well that you can’t put the book down until it is finished. Susanne Bellamy has a wonderful ability to assist her readers to escape with her characters, Eva and Luc, into their world. I began to believe that I too was transported to a calm protected tidal lagoon that is fringed in white sand and lush tropical bushes by a handsome as sin rugged man. I am eagerly awaiting the fourth and final installment of this fascinating series, The Emerald Quest. I need to know – where is the Emerald Necklace? 5.0 out of 5 starsLovely read! This story was an enjoyable read. Bellamy’s writing style is light and descriptive, allowing the reader to envision each scene and feel as though they are inside the story. Each scene leads to the next in an uninterrupted flow, so the novel is engaging from start to finish. I enjoyed that there was evidence of research and thought in this novel, giving it a more realistic vibe; there is substantial description of heroine Eva’s pineapple plantation, and the challenges she has to face as a single woman trying to manage such a big piece of land. Engaging in its own right, it manages to hold its own as a one-off novel, and to function in its original role as the third book in its four-book series, “The Emerald Quest”. I thought Annie, Luc’s cook, would have been such an interesting character to develop further with her lovely quirks, and if there were ever to be a spin-off story, I would hope she would acquire a larger role. Overall, the characters and their mannerisms and attitudes to life were handled quite well. Seb, the teenager, was probably the hardest to get right, but Bellamy has done an extraordinary job of depicting his traumatic family loss, though keeping his positive attitude towards life believable. I enjoyed this story and recommend to anyone with a sense of adventure and a love of pineapples! Set in the sixties, with plenty of angst due to miscommunication, a damnable piece of jewellery tempting the bad guys to fell deeds, a delectably determined damsel and dashingly desirable man with a chip on his shoulder, a troubled teen and the delicious sweet smell of pineapples lingering in the air, this lovely little romance, set in Hawaii, left me smiling. Pineapple is nature's perfect palate cleanser. 5.0 out of 5 starsLove this book! This is a perfectly written story with so much happening in it – strong conflict, excellent descriptions, vivid settings, well defined characters and an interesting story line. When I first realised the extent of the conflict between both Eva and Luc, I thought to myself ‘well I don’t know how on earth these 2 will ever get together’ which is a wonderful dilemma to ponder on. You know they eventually will end up together, because it’s a happily ever after romance story, but you’re so intrigued to read on to know how this is going to happen. And you’re not disappointed. Our hero has to work really hard to get our heroine to trust him, not to mention the fact they both have their own personal issues to overcome, such as their own trust issues relating to being hurt in previous relationships. Susanne has layered this story perfectly and given us great emotional depth. Set against the beautiful backdrop of Hawaii in the 1960’s, with an intriguing mystery to boot, this is a fantastic story with wonderful characters you will fall in love with. Susanne has done it again! I highly recommend this book to anyone. 4.0 out of 5 starsGreat suspense and full of drama. I really enjoyed this book. It did start out slow for me, but I persevered and was truly rewarded. The ending is fantastic. Great suspense. This is one series that is becoming more and more full of body with each book. Funny how one necklace has affected so many people over a span of time. The allure of it seems to keep growing while the mystery of it keeps capturing the people who come in contact with the ideal maybe they can be the one who finally finds it. Once it is learned that it existed and maybe has never been found also can tempt the good at heart but also the greed in a heart. It is now even later in time with the place now being in the US because of having to sell the family estate and move to all places a pineapple plantation. Trying her best to make a good life for her and her nephew-Eva has ventured into new territory all the way round with the promise if this succeeds her nephew will have a future. Upon the neighbor whom comes calling though right away-Luc, their adventure is only really just beginning. This author is able to weave the reader yet further into the mystery of the necklace while these characters have their own adventure filled with a story of their own that is very delightful to read. The road will be bumpy with many hiccups but as a relationship forms between Eva and Luc the danger that has followed the diary that contains the clues also creeps in. Now also to come after it is someone from where this necklace originated from so they say. You will be given humor along with the intrigue but also witness how love can overcome many obstacles. The suspense is masterful but also you get a hero and heroine you fall in love with too. And still at the end of the day you will be glad of what the winning combination will be.